Lately my reading has listed heavily toward young adult fiction. Never mind why. All you need to know is that the latest representative of this genre to sail through here was Ship Breaker by Paolo Bacigalupi. The moment I heard that title I knew what the story would be about. I knew, because I’d recently read The Outlaw Sea: A World of Freedom, Chaos, and Crime, by William Langewiesche which included “The Shipbreakers”, his story, originally written for The Atlantic Monthly, about hulks being torn apart on an Indian beach. A story that perfectly encapsulates our modern dilemma: all that is wrong with the world, combined with all the reasons that what is wrong with the world cannot be fixed. For the record, I fell in love with Langewiesche when, wowed by his book about adventure and catastrophe on or beside the sea, I Googled him and found this photo. I fell out of love with him when I heard he was writing a book about “the miracle on the Hudson.” I subsequently fell back in love with him upon reading this Time interview, which reassured me that one of my favorite writers hadn’t sold out to media hype and sentimentality. You should definitely read The Outlaw Sea, and anything else Langewiesche chooses to write. He’s that good. But this post is not about him. Ship Breaker is categorized as science fiction, but it’s really dystopian fiction. This category is a favorite of mine. I’ve read and loved many examples of the type: The Handmaid’s Tale, Oryx & Crake, A Canticle for Liebowitz (#1 so far), World Made by Hand and The Road, to name a few. I expected to lose myself in this one too and read until dawn. I was extremely surprised to find instead that, less than fifty pages in, I set it on my bedside table. It languished there for weeks. Note to Paolo Bacigalupi: If you’re reading this, please don’t write me off as one who didn’t get it. Read on. Of course dystopian fiction often dovetails with a related form called post-apocalyptic fiction. Ship Breaker is not, strictly speaking, post-apocalyptic, but it is surely post-something. At the very least, the world of the book is post-peak oil. It may also be post-environmental, or even post-societal. But none of these things bother me in fiction. What kept me from reading past that first few pages for so long was empathy. Nailer, the character referred to by the title of Ship Breaker, is a young boy. I can vaguely place him somewhere between 12 and 15, but even he doesn’t know how old he is. In his world, age isn’t important. What’s important is size, and Nailer is on the cusp. He’s growing. Soon he’ll be too big to continue his current job, but he’s not big enough to do heavy work. There is no middle ground. He worries about the twin specters of unemployment and homelessness in a setting where killer hurricanes regularly destroy entire cities. Until recently it was hard for middle class Americans to imagine such a plight. We vaguely knew a child growing up in the slums of India, or Bangladesh might face a life like Nailer’s. Bacigalupi, by setting his story in a not too distant future, and on the shore of the Gulf of Mexico, throws this dire existence right up in our faces. Perhaps I could have slept nights after reading the opening pages of Ship Breaker if the Deepwater Horizon hadn’t exploded only 20 days before the book’s May 2010 release, devastating the Louisiana coast. Or if the political winds weren’t blowing quite so hard toward a world where there will be few safety nets. Eventually I calmed my fears and forced myself to read on. And I enjoyed the story. Bacigalupi, much like Margaret Atwood, is adept at thinking current events through to their logical, potential, unwelcome conclusions. Be warned, those conclusions aren’t always conducive to a good night’s sleep for anyone with children or grandchildren. Nailer contends with henchmen engineered by combining human DNA with that of tigers, with cities sunken by melted ice caps, with an economy run by corporations, clans and cartels, on slave labor, in a world where government oversight no longer exists. In other words, a third world brought to the shores of North America by the bottom line. Not that such a world shouldn’t be here. Not that we Americans should be insulated from hardship. To understand a little more about the world Bacigalupi envisions for Nailer, look at these photos of ship breaking by Edward Byrtynsky. 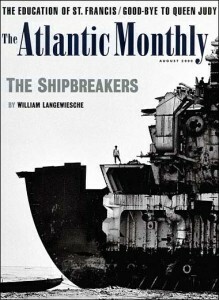 Note: While researching links for this post I ran across a letter to the Atlantic editor commenting on the original publication of “The Shipbreakers.” I’m not informed about the economics or policies inherent in the processes for disposal of waste ships. Other than reading Langewieshe’s book I’ve no exposure to the topic, so I can’t discuss the letter writer’s critique of the piece. Interesting though, is the fact that the writer works for a large metal recycling firm based in Louisiana. A firm that may in fact be something like the company for which Nailer works. What I found chilling about this letter, after witnessing the Gulf oil spill disaster, and after reading Ship Breaker, is the writer’s call for an industrial solution to the problems inherent in ship breaking. Second, to guarantee capitalization costs, investors will undoubtedly require subsidies or levies from states or the shipping industry to compensate for the effect that vacillating scrap prices have on enterprise stability. After I quit laughing at how the capitalists will insist on subsidies, while the human ship breakers have for decades been left to rot, that idea kept me awake for several more nights. Shipbreaking, just one of our nightmares. I do my best to keep my audience happy. I can’t believe you found a way to post that photo of Langewiesche on Tidal Life. Nice.